Do justice, embrace faithful love, and walk humbly with your God. This year, we are starting an exciting new program for 6-12 graders to explore and learn about issues of injustice in our community, in our country, and in our world and to consider ways that we might do our part to make a difference. 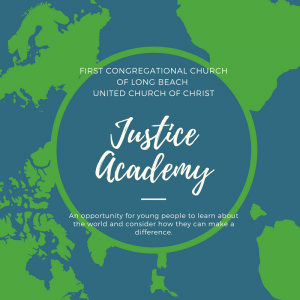 The FCCLB Justice Academy will create a community of justice learners who gather monthly to learn about a justice topic and then ventures our into the community to engage in acts of service and advocacy related to that topic right here in our own community. The Academy will gather one Sunday afternoon each month and will go on a field trip/ service opportunity one Friday or Saturday each month. Service projects can be counted toward school service learning credit. The culmination of this program will be a social justice experience planned by the academy for the First Church community and the receipt of a certificate in Social Justice Education and Action that could be listed on college and employment applications. Please contact Rev. Douglas to sign up and to learn more about this exciting new program. Registration for Sunday School is now open! Registering your children is quick and so important! Registration of every participant helps us to provide adequate resources and volunteers for all children, youth, and adult volunteers. To register, go to: https://goo.gl/forms/Gjc8hQ7B2a9z0zBU2. All Seasons Choir is our Youth Singing choir open to all children and youth who like to sing and perform. Parents are welcome to stay with their children. We will participate in our Christmas Eve pageant and are planning for a Spring musical April of 2018. Our youth music groups perform throughout the year in Sunday Morning services and at other events when possible. There is no audition, participants just need a love of music! Please feel free to contact Matt or Tracy Balin with any questions. Matt’s email is mattsimports@hotmail.com and Tracy’s is bellgirl99@hotmail.com. Join friends of all ages from around the Southern California Nevada Conference of the United Church of Christ for a Fall weekend at Pilgrim Pines or just come up on Saturday for some tasty apple pie homemade from local apples. More information and a registration link to come soon!